It’s National Poetry Month, the largest literary celebration in the world. Created to encourage the artistry and legacy of poets and encourage the reading and teaching of poetry. The Academy of American Poets has come up with 30 ways to celebrate national poetry month–like buying a book of poetry at your local bookstore, attending a poetry reading, or signing up for a “Poem-a-Day”. Sign up for a daily dose of poetry with the New Yorker Poetry Bot. You’ll get selections of poems from every decade on Twitter or Facebook. NPR wants your original mini poems on Twitter. And even Entertainment Weekly has weighed in with a list of 12 new brilliant poetry collections to read this month. For some international poetry, check out Two Lines Online Exclusives from our latest journal issue! 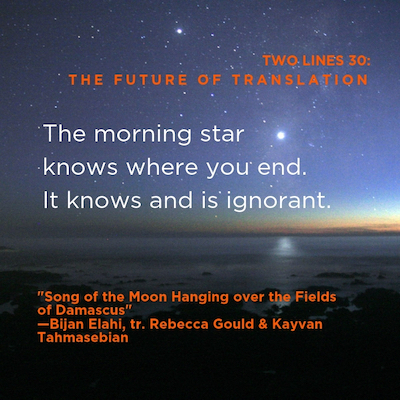 This issue features poems from Korean, Vietnamese, Spanish, Arabic, and French. “Someone is always crying at dawn. Either at the morning church service, or at the entrance of a motel, or at the end of those wood floors you find only in Korean buildings. We’ve got an entire world of poetry online from past journal issues available here.